Understand your true financial goals. Develop the best possible plan for working towards those goals. Monitor progress to keep us both on track at each step of the process. The Discovery Meeting - At our initial meeting, we will conduct a discovery interview. Together we will identify the obstacles you face in working towards your financial goals. We will look at where you are, where you want to go and how we can maximize the possibility of getting you there. The Investment Plan Meeting - At this meeting, we will present a complete diagnostic of your current financial situation and our recommendations for how we help you bridge the gaps in order to work toward your goals. This plan will form the foundation for all of our work together. Since we are looking for a life-long relationship, we encourage you to take the time necessary to be completely comfortable with the plan prior to taking the next step. The Mutual Commitment Meeting - At this point, we will be ready to make a mutual decision as to whether our firm can add substantial value and whether you are ready to proceed. Once the decision is made to move forward, together we commit to work toward achieving your goals. Additionally, we execute the documents necessary to put your investment plan in motion. The 45-Day Follow-Up Meeting - At this meeting, we will update you on exactly what has occurred since opening your accounts with us, as well as answer any questions you may have so that you have a complete understanding of what is happening with your money. 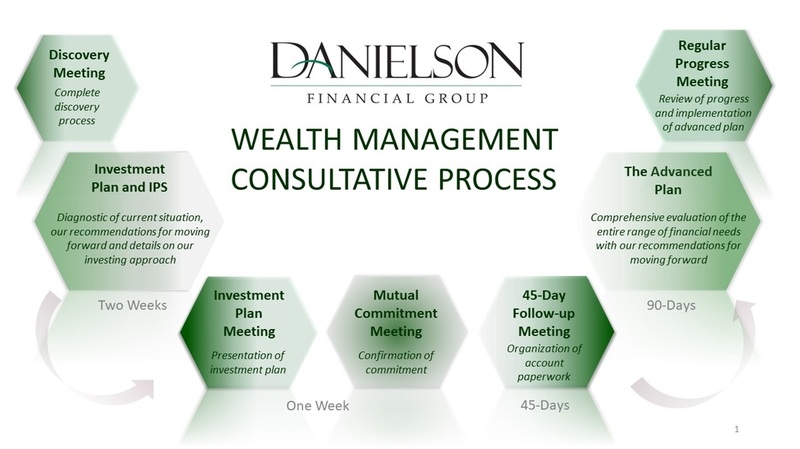 Regular Progress Meetings - These meetings, scheduled at intervals convenient to you and dependent on the complexity of your portfolio, give us an opportunity to review any major changes in your personal or financial situation since our last meeting, and determine if these changes necessitate adjustments to your investment plan. We will also review your overall progress towards your long-term financial goals.